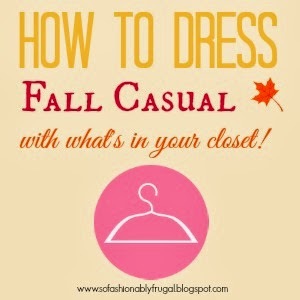 So Fashionably Frugal: Dress Fall Casual With What's Already In Your Closet! Dress Fall Casual With What's Already In Your Closet! It's comfy, it's casual, and it's fashionable?! So..here are some of my favorite tips and tricks to help you nail this trend! 2) Add Comfy Elements - Anything comfy will do. Just make sure that the colors all go with one another! Some of my favorites are knee high socks, infinity scarves, mittens, & snow hats. 3) Jewels are Optional- If you want to make your casual look a little more glamorous, add minimal amounts of jewelry. Midi-rings, a pendant necklace, etc. Otherwise, you can skip it. 4) Carry Around A Hot Drink - This is just my personal weirdness. But everything just feels cozier with hot mugs of apple cider or coffee. Try it out!